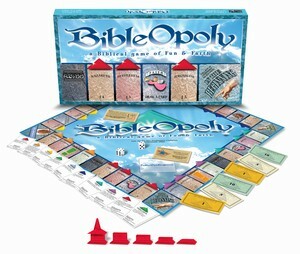 One of the most popular Christian games of all time! BIBLEOPOLY has very unique game play. The object of the game is to be the first player to build a church in one of the Bible cities. In BIBLEOPOLY, you canâ€™t win by destroying your opponents. You will only win by assisting the fellow players. Cooperation is what allows you to gain the things necessary to build your church and be a winner. An interesting twist on Monopoly. Instead of taking your opponents to the cleaner you actually must find ways to help them as you go. By helping others you are able to build your church and then win. A good way to teach the young ones a few life lessons.